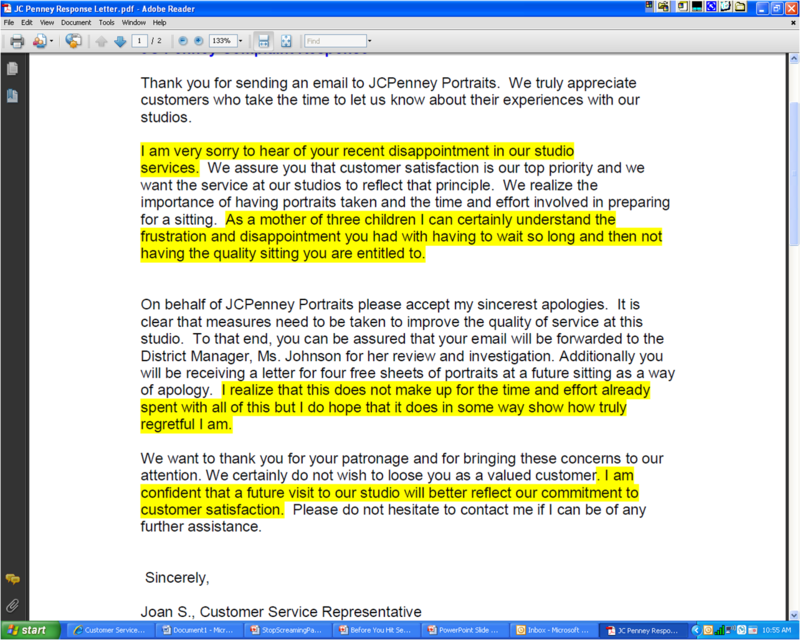 A few years ago one of my clients sent me a copy of an email she’d received from JCPenney Portrait Studio. My client, Angela, had taken her 2-month old daughter to the studio to have her very first professional photo taken. Though Angela had an appointment, she, her husband and infant daughter waited for more than 45 minutes past their appointment time. That WOWed me too. This representative related to Angela and responded with sincere empathy. That really resonated with Angela. Don’t you just love that last sentence? “I realize that this does not make up for the time and effort already spent with all of this but I do hope that it does in some way show how truly regretful I am.” The representative is offering a personal, heartfelt apology. The bottom line: When you are responding to customer complaint emails, take the time to express sincere empathy by relating to the customer and responding based on this empathic relation. Also be sure to always offer a heartfelt apology. When you do, you will not only solve the problem the customer experienced, but you will restore their confidence and regain goodwill. I really like your Tips and Articles. I found them very usefull. I wonder if you have some material to share related a empathy in Email-based Customer Services related to Holidays, Vacations, Graduation or Honey-moon. For example, a customer wrote an email asking for a Honeymoon trip, which is the best way to show empathy?